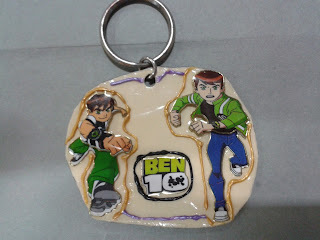 Pygmy Arts: Ben 10 Key Chain!! Anyways a cute friend of mine was a little upset with me. When i had been to his room, I saw his bed sheets full of Ben 10 cartoon pics. I found it so weird and funny that i ended up laughing out loud. And my poor little friend started pouting and then refused to talk to me how much ever i tried. I had to make up to him and kept thinking hard that how should I? 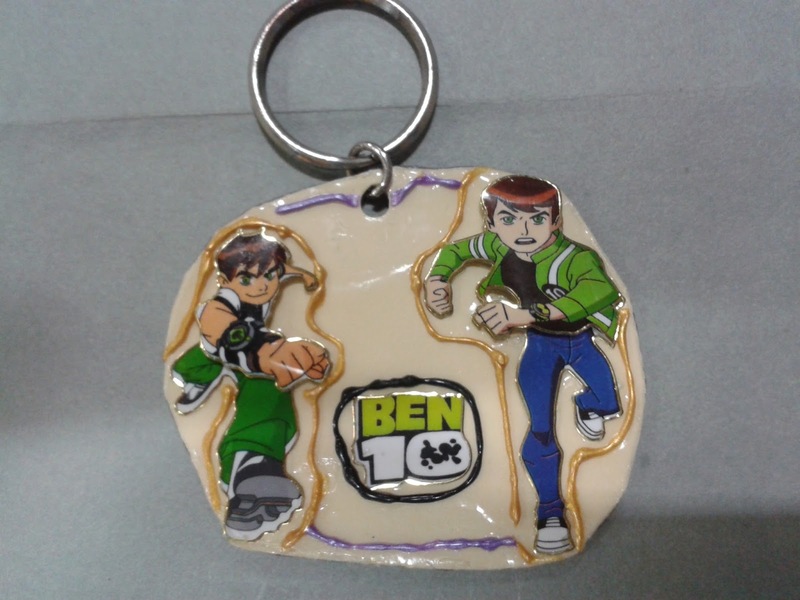 Then it struck me, that why not make a Ben 10 key chain and gift him.I felt sure that it would cheer him up.So here's the key chain that i made for him. 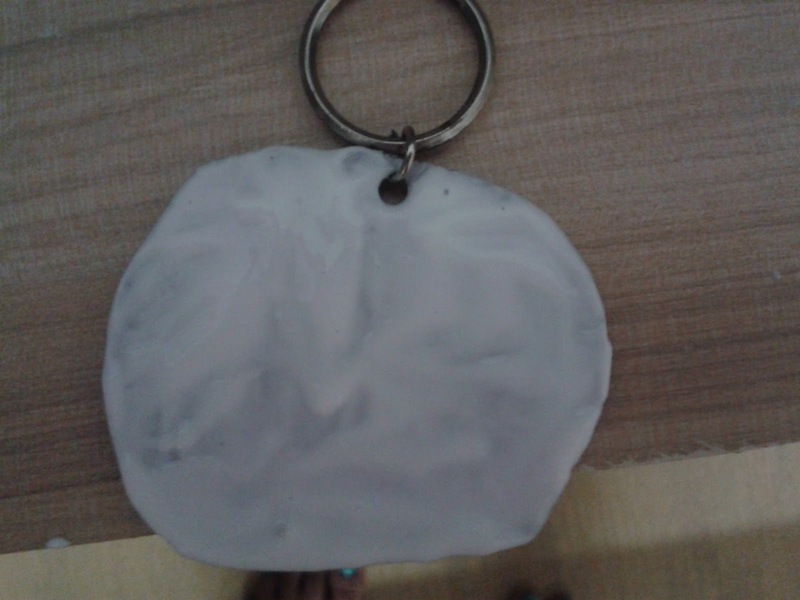 Here is how i made this cute little key chain. I cut out a piece of cardboard and applied a thick coat of fevicol on one side and let it dry. 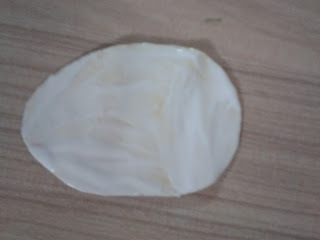 After it dried up, I repeated the process for the other side. I punched out a hole using my single hole punch and adjusted the ring in it. I decorated one side using the Ben 10 stickers and fevicryl colours. The layer of glue on both sides will protect the cardboard from getting spoilt in rain. He extremely loved the key chain and my acceptance of his favourite cartoon character. I got a big big tight hug from him and i was all smiles!!!! Hopefully you guys like my little experiment and project as well. Please do leave back your comments. They mean alot to me !! This looks awesome.Love the shine the fevicol has given. What a lovely gifting idea!..Your keychain looks so cute ! Thank you so much for playing along 'Crafter's Corner' # 11 and Best of Luck! What a cute little story and a cute idea to make a little one happy.I got the same treatment from my friend's kid when I made the mistake of making fun of Chota Bheem.lol.Thanks for playing along with us at Crafters corner challenge #11.Wish you all the best.